Receiving much praise since the first season, variety program Go Fighting <極限挑戰> continues to be one of Mainland China’s favorite shows. 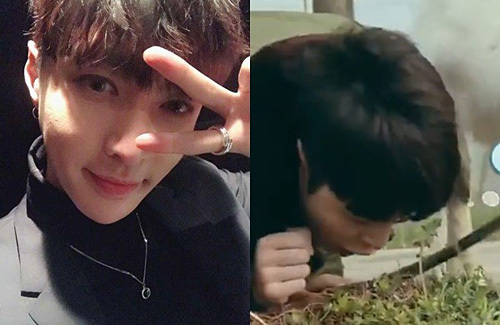 Former EXO member, Lay Zhang (張藝興) appeared as a guest for season four and instantly became the highlight of the first episode after eating grass off the ground. Throwing his idol image out the window, Lay demonstrates his ability to blend in with the farmers when he took his sheep to a grass field for feeding. While he was watching the sheep munch on the grass, Lay suddenly stooped down and ate some grass, surprising his five other co-stars, including Wang Xun (王迅), Huang Bo (黃渤), Huang Lei (黃磊), Sun Honglei (孫紅雷), and Show Luo (羅志祥), as well as viewers. While the singer, also interestingly known for his hit single, Sheep, caused a lot of buzz on the Internet for his bold move, some fans were worried and kindly reminded him to be more wary of eating unsanitary food. The show, which centers on a celebrities taking up a lifestyle of local farmers, also require artistes to choose a more farmer-friendly name instead of their actual names. Lay called himself Zhang Jiashui (張加帥) on the show, which was actually Lay’s official birth name when he was younger. Later, he changed it to Zhang Yixing when he began his career as an artiste. Don’t try this at home folks. Grass is very difficult to digest for humans and will upset our stomachs, it also contains a lot of silica, which is abrasive to human teeth. Please correct your typo. Lay is still very much part of EXO even though he hasn’t been promoting with them in the past year and a half, the former members are Huang Zitao, Luhan and Kris Wu Yifan.